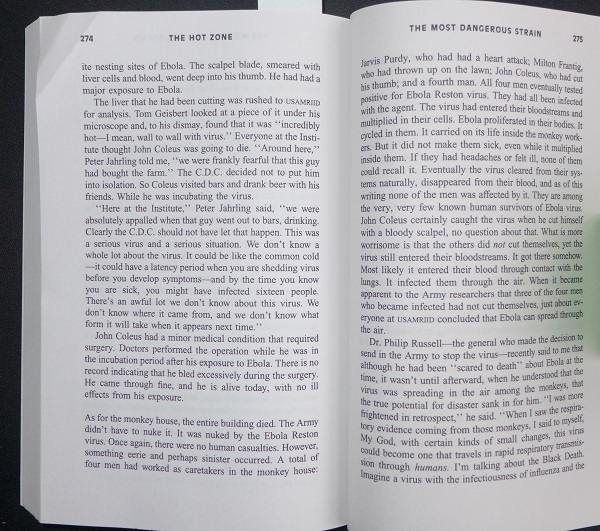 Details of the airborne transmission and the "nuking" of all the primates in an entire research center are detailed beginning on page 273 of The Hot Zone by Richard Preston, a non-fiction documentary book based on dozens of detailed interviews with top military virologists. This non-fiction book was called "A riveting nonfiction thriller" by the New York Times. In 1989, Reston, VA -- one of the most famous U.S. planned communities located about 10 miles from Washington DC -- stood at the epicenter of a potential biological disaster. 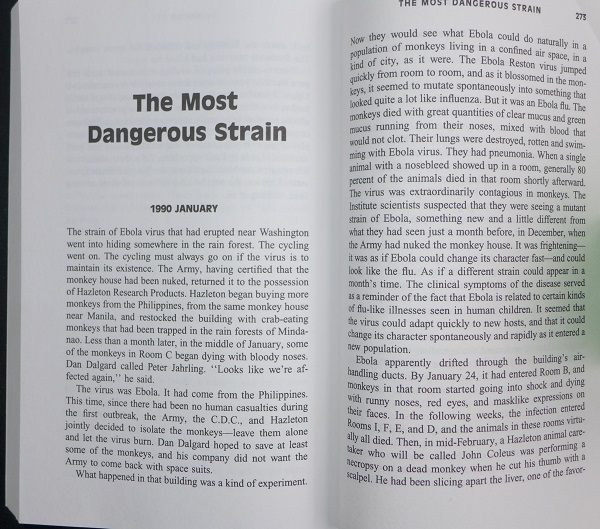 This well-known story was narrated by Richard Preston in a bone chilling account related to the recognition and containment of a devastating tropical filovirus at a monkey facility -- the Reston Primate Quarantine Unit. In a wild attempt at revisionist history, the Obama administration is today telling us that Ebola can't be airborne; that it can't spread via contaminated surfaces; and that we are all in no real danger from it. The testimony of these U.S. Army virologists from 1990 tells a very different story of what happened with a strain of Ebola that was named "Reston" because it got out of control in Reston, Virginia and was barely contained. The threat from any strain of Ebola, we are told, concerns how rapidly it can mutate and adapt to new hosts while becoming airborne. "Ebola... jumped quickly from room to room... a lot like influenza"
"...could look like the flu... a different strain could appear in a month's time... drifted through the air-handling ducts"
The Institute scientists suspected that they were seeing a mutant strain of Ebola, something new and a little different from what they had seen just a month before, in December, when the Army had nuked the monkey house. It was frightening -- it was as if Ebola could change its character fast -- and could look like the flu. As if a different strain could appear in a month's time. The clinical symptoms of the disease served as a reminder of the fact that Ebola is related to certain kinds of flu-like illnesses seen in human children. It seems that the virus could adapt quickly to new hosts, and that it could change its character spontaneously and rapidly as it entered a new population. Ebola apparently drifted through the building's air-handling ducts. By January 24, it had entered Room B, and monkeys in that room started going into shock and dying with runny noses, red eyes, and masklike expressions on their faces. In the following weeks, the infection entered rooms I, F, E, and D, and the animals in these rooms virtually all died. "USAMRIID concluded that Ebola can spread through the air"
John Coleus certainly caught the virus when he cut himself with a bloody scalpel, no question about that. What is more worrisome is that the others did NOT cut themselves, yet the virus still entered their bloodstreams. It got there somehow. Most likely it entered their blood through contact with the lungs. It infected them through the air. 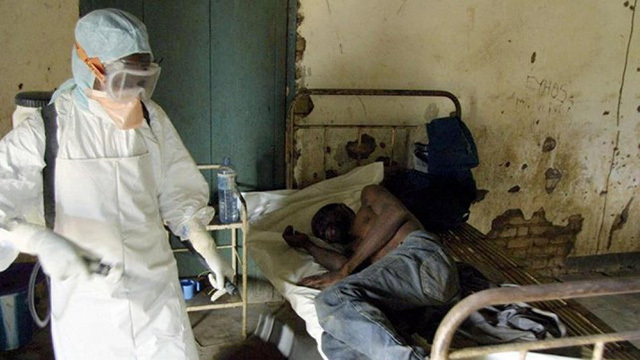 When it became apparently to the Army researchers that three of the four men who became infected had not cut themselves, just about everyone at USAMRIID concluded that Ebola can spread through the air.